Dusseldorf, Germany – Philips, the global leader in lighting, will be showcasing its Fresh Food LED lighting portfolio at Euroshop (February 16-20, 2014), offering supermarkets the perfect lighting for different types of fresh foods. Light recipes, or optimized light spectrums, can increase sales by highlighting the freshness of the food on display. They also help to reduce light-induced discoloration of foods such as sliced meat, which can reduce the attractiveness of the products. Product presentation is crucial for supermarkets, as customers have more choice than ever before and take for the granted the availability of almost perfect fresh produce from around the globe throughout the year. The more attractive a product looks, the more likely customers are to purchase it, and research has shown that we are inclined to pick the greenest cucumber, the yellowest banana or the reddest tomato. Light recipes can also be used in all fresh food counters including the sliced meat counter allowing retailers to choose how they want the produce to look, whether more enhanced or more natural depending on customer preference. The light recipes are based on research that studied how the tuning of the light spectrum suited specific products. Light recipes help to accentuate the color spectrum, meaning that a product’s colors reflect more light, thus creating greater contrast between the products and their surroundings. A higher level of color saturation brings out the characteristic colors of individual products. In a trial conducted with the EHI¹ and a supermarket in Germany - sales volume of selected fruit and vegetables in the fresh produce department rose by 4.7% (3.5% increase in revenue) under light recipes proving that consumers are ever more demanding in regards to the appearance of their food. Poor lighting in food counters is a significant contributory factor in the discoloration of meat. 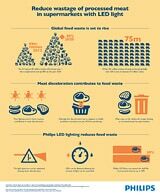 Research conducted by experts at Philips using artificial light has revealed that certain parts of the visible light spectrum can lead to stronger levels of discoloration in sliced meat. 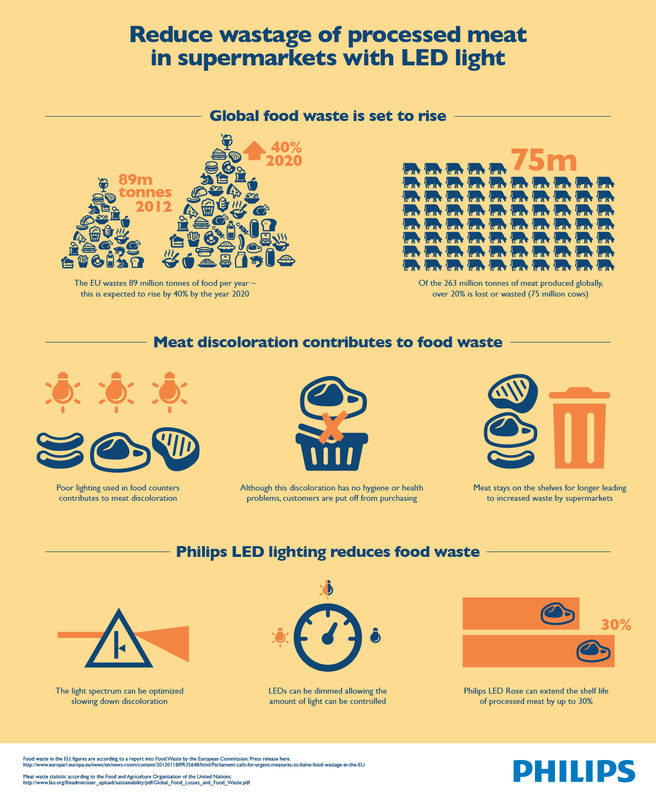 Although this lighting-induced discoloration presents no hygiene or health problems, this can have the impact of making products appear less attractive to purchasers and can lead to perfectly edible food going to waste. The most effective way to slow down lighting-induced discoloration is to control and optimize the level of light being used - a process made possible by Philips LED technology. Philips’ new LED Rose lighting solution slows down the discoloration process with an optimized light spectrum. When tested in laboratory settings, the light recipe extended the shelf life of sliced meats by up to 30% when compared to conventional White SON lamps. The meat thus remains attractive for purchase, also reducing food wastage. ¹ EHI is a scientific institute of the retail industry. The members of EHI include international retail companies and their industry associations, manufacturers of consumer and capital goods, and various service providers.